I let the recorder run during a small play-testing session resulting in this 15 minute long gameplay footage of Unending Galaxy, played as a pirate captain. I was running on the debugging build which, to reduce loading times, has less smooth ship rotations than the release build. Oh, at the 8th second mark, you can see an early prototype of the new map. 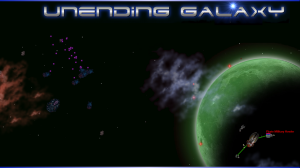 This is the official trailer for Unending Galaxy Beta 1.